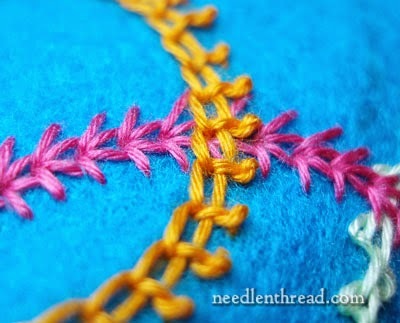 Crested chain stitch can make beautiful patterns! either in colour or maybe white on white. Today stitch of the week is the very beautiful crested chain stitch and is as always brought to you by Mary Corbet. 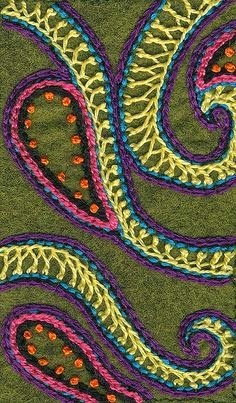 I have found a picture for you on Mary's site needle and thread and just take a peek at this. This is a a lovely outline stitch! 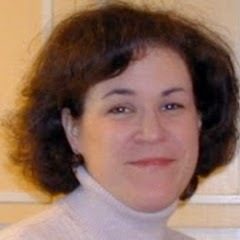 Also I thought I would find a photo of Mary for you all to see as many of you may not know what she looks like. Now you can put a face to that calming voice that has been guiding us all through all our tutorials. Have a wonderful weekend and make yourself a nice warm drink and take a look at how, with her normal ease, Mary shows you how to make chain stitch even more decorative.